Leslie: Most stand-up comedians aim to have a ‘point of view’ and a persona. What’s yours, please? Alasdair: I’m really just trying to be myself, but much, much funnier. But I suppose, from the audience’s perspective, I want to come across as a kind of anachronistic wizard savant. Many comics aspire to be the funniest person in the pub, but when I was a kid watching comedians, I thought they were exceptional, magically gifted human beings. I want to perpetuate that obvious lie. Leslie: How do you aim to capture your audience’s attention during the crucial first few seconds – and from then on how do you involve them? Do you play with their expectations? Alasdair: I have silly hair, Leslie. I have always had silly hair, and I want to emphasise that I did not grow silly hair in order to do comedy. But I do have silly, long, red hair, and I’m also tall so I get people’s attention immediately. Not always in a good way. Sometimes my appearance prompts immediate heckles, or people nudging their neighbour to make a crack about me looking like Jesus. But those are things I can (usually) deal with. Either way, I don’t really have to demand people’s attention because I look like I belong on stage. I do get laughs out of playing with the audience’s expectations, but regrettably, it’s mostly confirming rather than confounding their assumptions. I’m a long-haired vegan with left-wing political views. That is my curse. Leslie: What issues do you deal with on stage? Is your presentation self-mocking or mocking of others? Alasdair: I don’t know if I do deal with serious ‘issues’ on stage. I suppose I touch upon animal rights and a few other serious social issues, but I try not to be polemical or zealous about it. Not out of any comedic principal, I’ve just found that righteousness is not very funny. I am tiresomely righteous off-stage. I’ve been described as ‘self-deprecating’ a few times, but I don’t really see it. I think it’s quite self-aggrandising to get on stage and insist that everyone listen to you. I don’t think much of my stuff involves mocking myself or others. Having said that, I have one bit where I make fun of Americans for being stupid, because I am a comedy genius and the first person to notice this. Leslie: Do you follow the classic pattern of setup-punchline-tag, or do you aim at something freer such as an ongoing theme, a story or an imaginary conversation? Alasdair: I wish I had a systematic approach to writing jokes, but I’m in the process of writing my first hour show so I feel like I’m learning everything for the first time. The material is (that dreaded word) whimsical, but I think you could break it all down into setup-punchline-tag. There are actual jokes, in amongst the whimsy. My stuff definitely isn’t narrative, but I’m trying to get to the point where I can pull together common threads. To an audience member, I’m sure my show is currently just a jumble of bits of material. But I know that the material connects to the themes of emotional inexpressiveness, choosing the right path, and the power of magic words. So I want to draw those threads out and pull them together. I’m doing my best to create the kind of comedy show I really like, with tangents and detours but also a sense of direction. The fact that I’m doing this interview instead of working on that, should give a sense of how difficult I’m finding it. Leslie: How do you search for original material and how do you work on it? Alasdair: I have no idea how writing works. It takes me ages just to write an email, never mind jokes. I am trying to increase the frequency with which amusing ideas strike me, by sitting in a quiet room with a pen and paper. I’m not sure it’s helping at all. Leslie: How ‘close to home’ and personally uncomfortable or confessional is your work? Alasdair: My stuff is definitely not confessional. Confessional, personal, revelatory comedy is in the ascendant at the moment. And I think it’s great, but it’s not my thing. I do try to be honest, but, you know… Within reason. Leslie: Can you give examples, please, of the material you use that is true and material adapted from life – how is it tweaked/developed? Alasdair: I have a bit about a youth approaching me in the street to ask, “Do you use GHD?”, to which I give a couple of witty responses. This is word-for-word exactly what happened and is the only instance of me ever being funny in real life. Annoyingly, I think audiences believe I made it up. I find that I get limited value from anecdotes. I can’t say, “And you won’t BELIEVE what the bus driver said…!” because the audience won’t believe what the bus driver said. I’m working on a very new bit, that may not end up being material, about wearing a Wizard’s hat when I was 19 (which is true). It involves me wearing my Wizard’s hat while standing at a bus stop next to a neighbour who was a person of restricted growth, and the Tolkienesque image we unwittingly created. This is something that did happen, but not in exactly the way I relate it. I’ve simplified the story, but I’m also trying to make sure it ends with my neighbour getting the last laugh. I want to make sure that we’re laughing at the embarrassing situation I created, not the fact that my neighbour was a small person. I do claim to have worked in a fire station as a fire, for the firefighters to practice on. This is entirely a lie, but the audience is well aware of that and (hopefully) enjoys the silliness of the lie. Leslie: In your own life, what first drew you to stand-up? Who are your comic heroes – why them? Alasdair: I had quietly wanted to be a comedian since I was 11. My heroes as a teenager were Eddie Izzard, Bill Bailey and Reeves and Mortimer (disappointingly no women there, Alasdair). But I had a very catholic (please insert joke) taste in comedy. I would watch any comedy going, all on TV, because I didn’t know live comedy existed back then. I watched endless, terrible sitcoms because I liked seeing how they were put together. Leslie: What do you get out of bringing in poetry to your act? Alasdair: I don’t write comedy poems, but I do have a bit where I ‘improve’ on William Blake’s Proverbs of Hell. What I enjoy about it is that it’s fairly obscure, but the audience doesn’t need to be aware of Blake to find it funny. It’s nice to read Blake aloud to a comedy audience, and make them laugh at some very silly jokes, without laughing at Blake’s writing. It makes me feel like I’m giving people something they didn’t expect to like. Leslie: Besides making money or becoming famous, why do you gig? 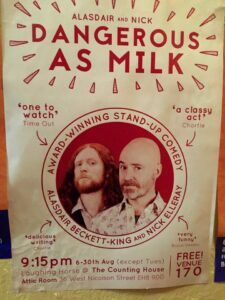 Alasdair: It is surprisingly, almost worryingly enjoyable. 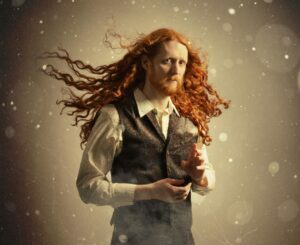 You can find out about Alasdair’s appearances at the 2017 Edinburgh Festival and book tickets here. Heaven’s Rage is a memoir and a collection of lyrical essays. In brief: ‘Heaven’s Rage is an imaginative autobiography. Reporting on feelings people don’t usually own up to, Leslie Tate explores addiction, cross-dressing and the hidden sides of families. Writing lyrically, he brings together stories of bullying, childhood dreams, thwarted creativity and late-life illness, discovering at their core the transformative power of words to rewire the brain and reconnect with life. “A Robin Red breast in a Cage / Puts all Heaven in a Rage” – William Blake. You can buy Heaven’s Rage here. I really enjoyed this post. I have never read an interview with a stand-up comedian before but I have, of course, watched them. We have a few quite good comics in South Africa as well. 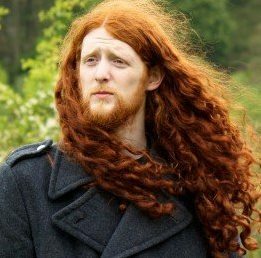 Alastair’s red hair is amazing! Yes, and Alasdair says some deep and thoughtful things here, but tongue-in-cheek as if he wasn’t sure he was saying them. He plays the wise fool. I was up at 4 o’clock this morning and it felt great to begin the day smiling and then laughing. He’s lovely. 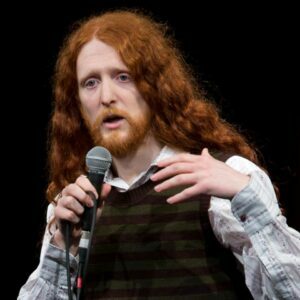 Alasdair is one of the most interesting rising comics around, and a lovely guy. I am looking forward to seeing his show in Edinburgh. nice peace!